And we’re back for the second installment of the series 24 Hours in Barcelona! 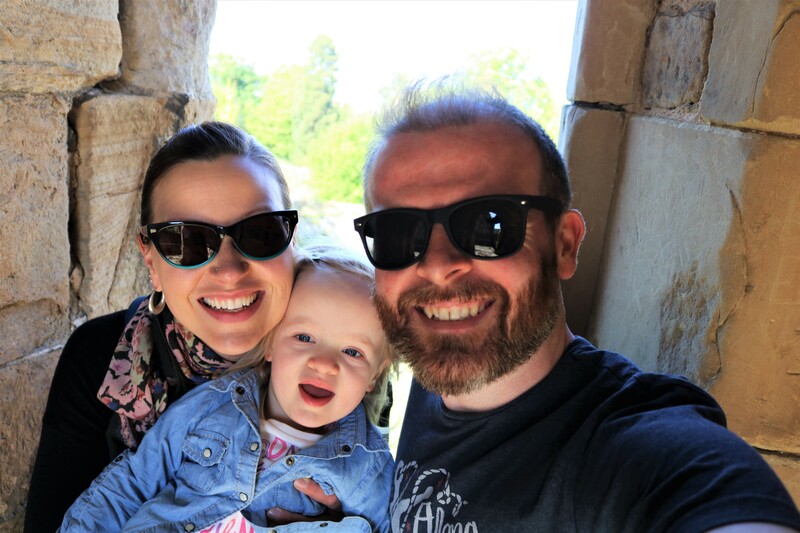 If you haven’t read the first installment yet, take a few minutes to head over and see what we managed to fit into our first few hours in Barcelona. Continuing down La Rambla, fresh juices from the market in hand, we spotted a tall statue in the distance. 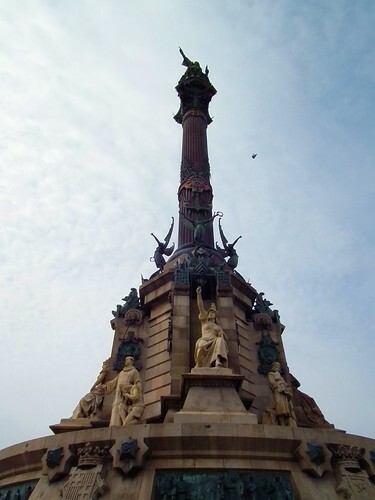 The statue we were seeing was the Mirador de Colón, a 197 foot (60 m) tall monument to Christopher Columbus, which was erected in 1888 as part of the Exposición Universal de Barcelona. 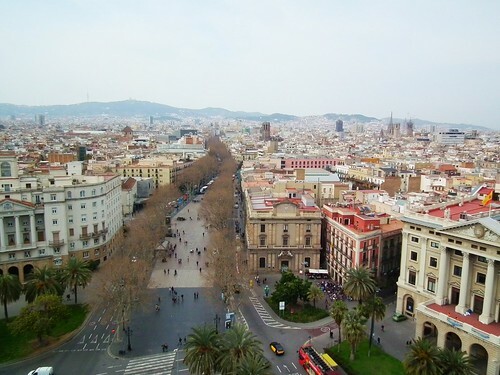 Venture inside and you can take a (rather tight) elevator ride to the top and enjoy panoramic views of Barcelona. According to the man who took us up in the elevator, on a clear day you can see all the way out to the island of Menorca, some 200km off the coast of Spain. 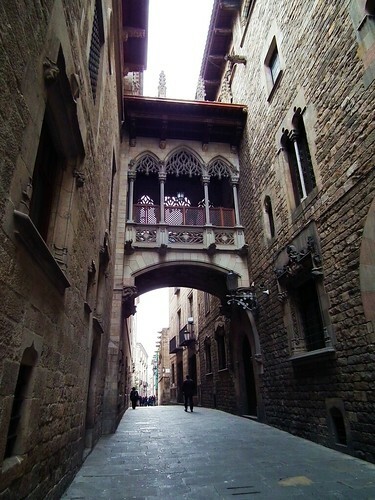 You can’t visit a city like Barcelona and not spend some time just wandering the streets and alleyways and discovering little squares, exhibitions, shops, restaurants and other hidden gems. 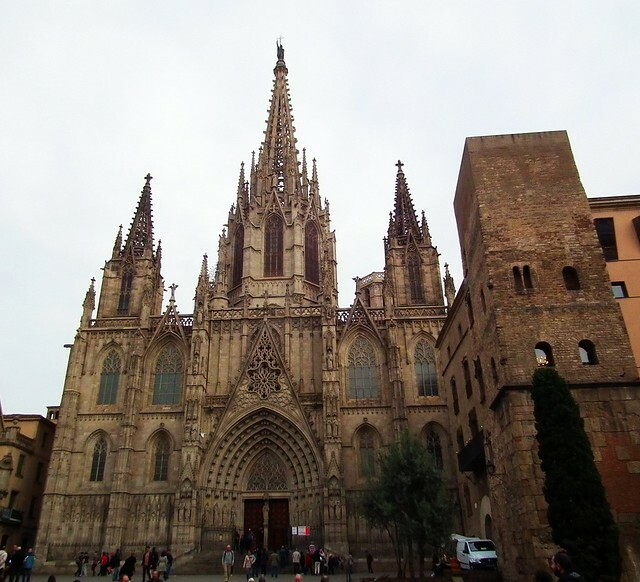 All that wandering had taken it out of us, and upon discovering that our planned next stop, the Catedral Basilica de Barcelona, wasn’t to re-open for a little while, we took the opportunity to stop and refuel at one of Barcelona’s many cafés. A cold beer for Damian and strong coffees for my mom and I were just what the doctor ordered, and as a bonus there was a bathroom. I’m a girl of simple pleasures. The seat of the Archbishop of Barcelona doesn’t disappoint when it comes to architectural interest, offering an interesting stop whether religious or not. 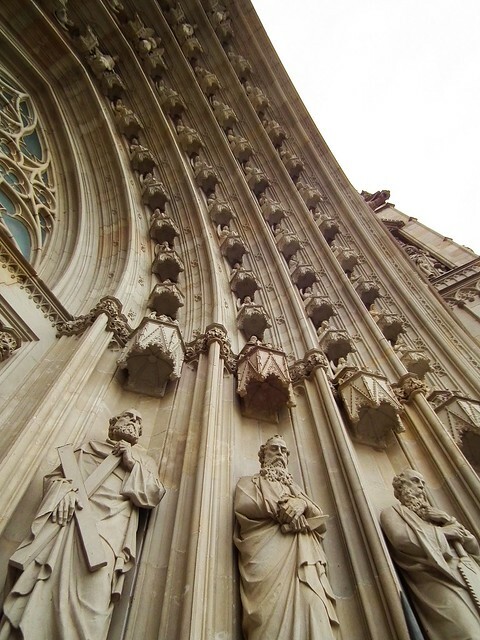 From the outside, it’s stunning; all piercing towers and gothic drama, adorned on all sides with delicate sculptures and leering gargoyles. 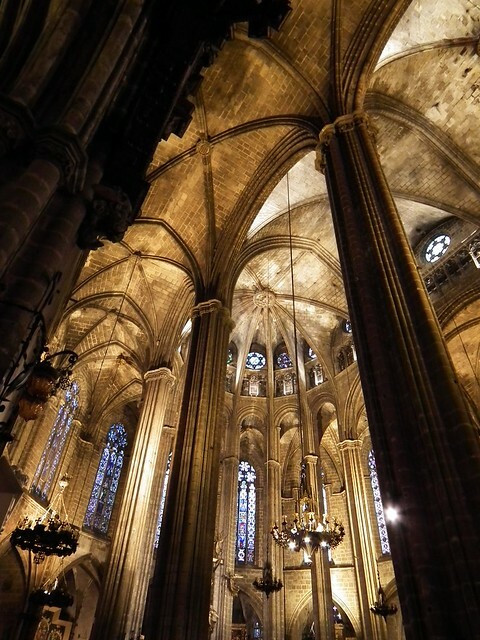 On the inside, the drama continues, with towering vaults, delicate stained-glass and flickering candles. 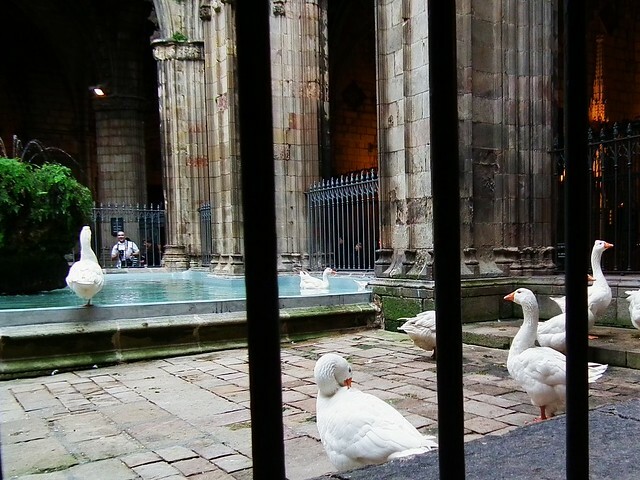 My favourite part of the Barcelona Cathedral, however, was the internal cloister and its resident geese. The cloister was completed in 1448 and includes the curious Well of the Geese, which houses thirteen geese, purported to be in honour of St. Eulalia, entombed in the cathedral, who was martyred at the age of thirteen. 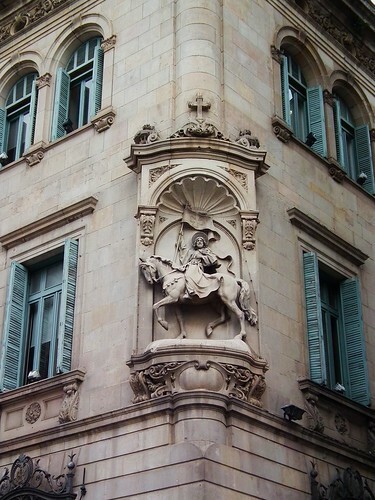 You can’t go to Barcelona without encountering something of the city’s most famous resident, Antonio Gaudi. Gaudi has become synonymous with Barcelona, and seeking out some of his masterpieces is well worth the time even for those with only a passing interest in architecture. Casa Batlló was once the family home of the Batlló family, who hired Gaudi to redesign the nondescript building in 1904. 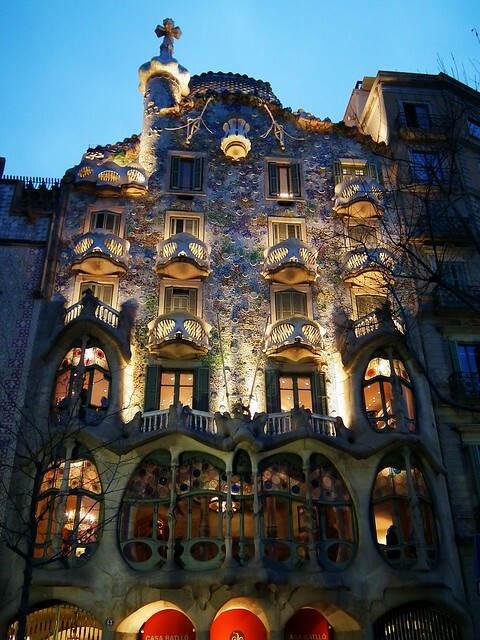 To imagine that Casa Batlló was once a standard building in unimaginable, as today it is anything but standard! 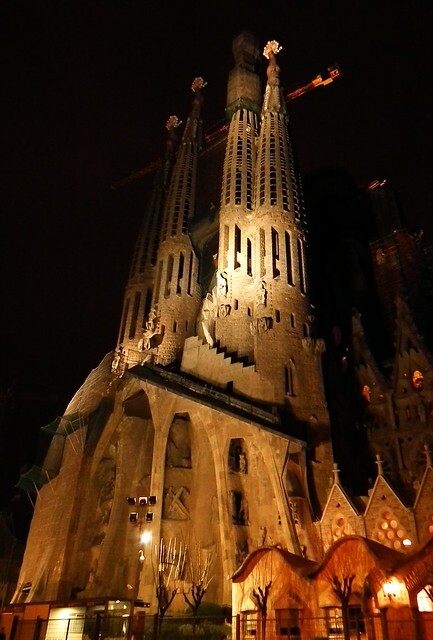 You can visit the interior of the building, which is now a UNESCO World Heritage Site, for the low low price of €21.50, but as it was getting late we decided to keep our €64.50 in our pockets and move onto another of Gaudi’s famous Barcelona landmarks. 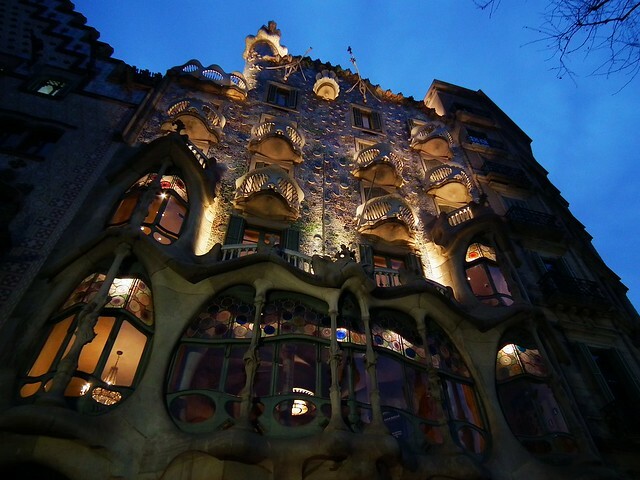 Continuing on from Casa Batlló we headed in the direction of another of Barcelona’s Gaudi designed buildings, Casa Milà, better known as La Pedrera. Unfortunately, it was covered in scaffolding for restoration work so after a quick consultation with the map we decided to keep walking and see if we could make it to the most famous of Gaudi’s works, La Sagrada Familia. Although it was closed by this time we assumed that it would be well-lit at night and worth the long walk at the end of an already long day. Although the basilica is enormous, with towers that reach heights in excess of 500 feet, it wasn’t until we were almost upon it that it finally came into view. Sadly, the Sagrada isn’t particularly well-lit at night, but it was worth the trip to be some of the only people admiring this awe-inspiring building, which we would come to appreciate even more when we visited again the next morning. After a lovely dinner at a nearby café it was time to head back to our hotel and rest up for the next morning and our final few hours exploring the magnificent city of Barcelona!